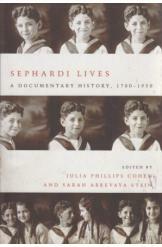 Sephardi Lives: a Documentary History, 1700-1950 by Julia Phillips-Cohen and Sarah Abrevaya Stein, Jewish History. A history of Sephardic Jews from early modern times through the nineteen-fifties. Includes one hundred and fifty primary source documents from Sephardim living from the Americas to the Middle East throughout the period.